Japchae Sauce - Glass Noodle Sauce - Korean Stir Fried Sweet Potato Noodle Sauce. A Korean Glass Noodle Sauce with Soy Base. 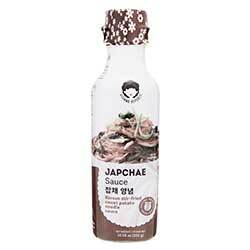 Great as a stir fry sauce, for spicing up everyday dishes and for making Japchae. Ingredients: Soy Sauce 36.6% (Water, Defatted Soy Bean, Brewed Soy Sauce (Wheat), Salt), Sugar 30%, Corn Starch Syrup, Water, Ethyl Alcohol, Thickener E1401, Sesame Oil, Salt, Black Pepper, Garlic Powder (Garlic, Maltodextrin, Anti-Caking Agent E551), Thickener E412, Sesame Seeds, Grapefruit Seed Extract.